Peanuts Volume 2, the trade paperback collecting issues Vol. 2 #1 through Vol. 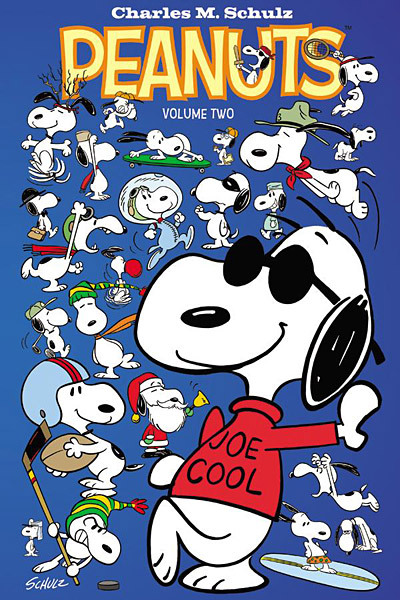 2 #4 of the Peanuts comic book, was released on March 6, 2013 and is now available. You can get it at your local comic book shop, directly from Boom! Studios, or Amazon.com. The list price is $13.99. This paperback contains all the stories and classic Sunday Peanuts comic strips that appeared in those four issues, and as a bonus features a new cover unique to this collection (shown here) together with reproductions of both the regular covers of the issues and the "first appearance" variant covers.